Click here to fill out a credit application. We have reliable, friendly lenders waiting to help you purchase the equipment you need – nationwide! Lease or Finance — Which is Better? 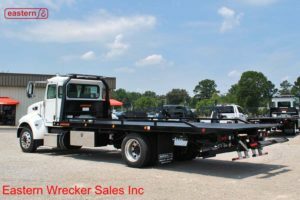 Why Buy from Eastern Wrecker Sales Inc? 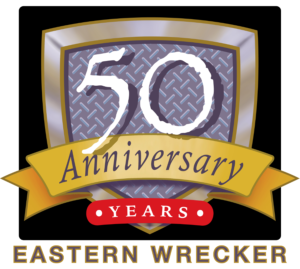 Eastern Wrecker Sales Inc is the oldest distributor in the nation of the fine rollbacks and wreckers manufactured by Jerr-Dan, an OshKosh Corporation company. We are also proud distributors of the Landoll line of transportation products, trailers tough enough to move the world. Please take a look at our large inventory of new Jerr-Dan carriers or rollbacks, new Jerr-Dan wreckers or tow trucks, and new Landoll trailers for sale. We have a large inventory of used Jerr-Dan wreckers or tow trucks, used Jerr-Dan carriers or rollbacks, and used Landoll trailers for sale. We also have used equipment of many other brands for sale: Century, Champion, Holmes, Vulcan, Challenger, Eagle Claw, NRC, Dynamic, Chevron, Zacklift, Recovery Solutions, and more. We offer everything from small self-loading wheellifts to big hydraulic wreckers, car carriers, and industrial carriers with 15-tons of capacity and more. If you are interested in towing, recovery, and transport equipment, you are in the right place! * Payments quoted are examples based on 20% down and a 72 month term on new items, a shorter term on used items; example payments do not reflect any taxes or fees; example payments quoted do not imply approval; credit approval/disapproval is dependent on the application process, and actual terms, if approved, will vary depending on the lender. Please ask your sales representative for more details! Please note that all used trucks, used equipment, or other used items offered for sale will be sold As-Is, without warranty. Any warranties on an item or items sold are those made by the manufacturer. Eastern Wrecker Sales Inc hereby expressly disclaims all warranties, either express or implied, including any implied warranty of merchantability or fitness for a particular purpose, and Eastern Wrecker Sales Inc neither assumes nor authorizes any other person or entity to assume for it any liability in connection with the sale of any item or items. While we try very hard to be accurate in representing the equipment, trucks, and other items offered for sale, please note that the details, specifications, and equipment listings of items offered for sale are subject to change without notice and are not guaranteed to be free from error. From time to time, manufacturers make changes that are not yet reflected on this website; from time to time, we may simply make a mistake. We strongly urge the buyer to examine any and all items prior to purchase and at the time of purchase. That way you get what you wanted, and we get happier customers. Thank you!